it's not OUR Revolution. I do wish you would quit misstating that. YOU may wish to cease making misstatements. Only if your conscience allows it, of course. Our Revolution https://ourrevolution.com/ DID officially make said endorsements of candidates that I posted about in my last post, not I in any official capacity. On a personal level though, I'm also fine with those candidates and other candidates that OUR REVOLUTION endorses. Whether or not it comes down to a third party [or Senator Sanders for that matter] or the Democratic 2020 election campaign pulling over disgruntled Trump voters in order to win, it's true change in Washington that's really important to all people who need leadership from the heart and not from the big corporation's money machines. Even when Mr Trump's 2016 rhetoric filled with promised lies of draining the swamp won him the election, it still demonstrated a loud and clear call for extreme changes in Washington. We'll see just how far Mr Trump's bellicose will take him against a true progressive candidate in 2020 [if not disposed of by impeachment before then] or if another opposing candidate isn't artificial concocted again by the corporate establishment. Today, dear reader, we’re going to discuss Bernie Sanders in 2020. I’ll try to steer clear of the Democratic primaries of 2016, which no one on the left wishes to relitigate yet no one on the left can resist relitigating. The associated questions cut to the core of the Democratic Party’s internecine disputes: Do we need to win back Trump voters, or do we need to ditch them and find some new ones instead? Should our priority be to reduce economic disparities or to reduce racial disparities—and how are the two issues related? If you want to cause fistfights, ask those questions in a crowded liberal room and then, for your own safety, leave. 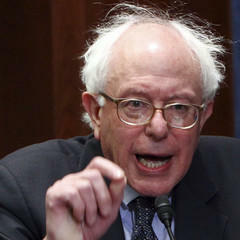 Bernie, for his part, shows few signs of slowing down. He has announced he is running for re-election as an Independent in 2018. He is participating in rallies. He has made two trips to New Hampshire in as many months. And, most important, he is tending to his grassroots army (something he wishes Barack Obama had done). During the 2016 primaries, I underestimated Bernie Sanders, but I learned my lesson, coming to see how tough the man was after all. As we look ahead to 2020, Bernie Sanders might be Trump’s strongest opponent. Sanders has several obvious advantages. People know him. He has good approval ratings—53 percent favorable, according to a recent Harvard-Harris poll. He’s been through a lot of the process. He is also leading the polls of New Hampshire primary voters, with support of 31 percent, followed by Joe Biden at 24 percent. But it’s the less obvious advantage that’s going to be our focus. While Bernie represents the left of the Democratic Party (even as an Independent), he’s culturally conservative on a few key issues. That makes him uniquely positioned to move—at least a little—to the right and win back some of the support Trump gained. We’ll never stop debating what happened in 2016. But if we look at the numbers, we can see that Trump was playing to pent-up demand. Nearly a third of Americans, it turns out, are conservative on social issues but liberal on economic ones. Until Trump came along, they didn’t have an obvious candidate. (A report released by the Democracy Fund Voter Study Group this summer, authored by New America fellow Lee Drutman, makes the numbers clear, particularly in Chart 2.) They were populists forced to choose between what they saw as lousy economic policy from Republicans and lousy social policy from Democrats. They might be the type who were, say, fine with Obamacare but unhappy with new gun laws or school-bathroom regulations. This is where Bernie Sanders comes in. Like Trump in 2016, Bernie seemed to grasp that endless foreign wars, the loss of dignified jobs, and the bailouts 2008 had changed the mood of the electorate significantly. Where Trump broke all of the rules and voiced heretical thoughts from the left, however, Sanders lacked the audacity to break all the rules and voice heretical thoughts from the right. This is something that most of us supporters for Senator Sanders already knew. This time, it's coming from the side that won. Tony Fabrizio said at a Harvard University Institute of Politics event Monday that Sanders could have prevailed where Democratic presidential nominee Hillary Clinton did not. It appears that Donna Brazile has found her way to speaking a pinch of truth - finally. I'm all for anyone who seeks redemption by telling the truth, but I'll not put a whole lot of stock in her anytime soon. If this allows her to sleep better at night, that's fine. I'll not begrudge her of that. DWS and Mrs Clinton - not so much. I imagine some Bush Clinton Democrats will regurgitate all over themselves to save their queen with bs spin. Truth is, it doesn't really matter because what keeps coming out about what the DWS-DNC did to Senator Sanders only confirms what many of the Senator's supporters already knew. So, when these Bush Clinton corporate Democrats do what they do best and spew bs that Senator Sanders caused Mr Trump to get elected, remind them that it was the DWS-DNC who force fed voters a losing candidate stealing away one who would have defeated Mr Trump. The DNC official, Donna Brazile, now a political analyst, wrote in Politico Magazine on Thursday that she discovered an August 2015 agreement between the national committee and Clinton’s campaign and fundraising arm that gave Clinton “control (of) the party’s finances, strategy, and all the money raised” in exchange for taking care of the massive debt leftover from President Barack Obama’s 2012 campaign. Brazile wrote that she had “promised” Sanders to find out if the DNC had intentionally “rigged” the primary system in order to prop up Clinton and assure she became the nominee. That assertion first popped up after the DNC’s emails, hacked by Russians, had been published online and showed former DNC Chairwoman Debbie Wasserman Schultz and others may have tipped the scales for the Democrat Clinton versus Sanders, an independent seeking the Democratic Party nod. Normally, candidates take over their respective party’s operations after securing the nomination, but Brazile wrote Clinton had done so almost 15 months before last year’s election. And when you argue "that it was the DWS-DNC who force fed voters a losing candidate stealing away one who would have defeated Mr Trump." I'm going to be there to point out that you are arguing from the position of conjecture and speculation. Up until yesterday morning, Bernieville was ready to lynch Donna Brazile. I see already, as expected, that some Bush Clinton Democrats don't understand the word redemption. Why someone like Donna Brazile, who was one of the corrupt foxes in their corporate establishment hen house, has come forth to free her soul. To admit that their system was rigged against Senator Sanders and all the other contenders for the nomination. Mrs Clinton was pre-chosen. The die hard Bush Clinton Democrats, they'll never admit to what the DWS-DNC did. For that, as I have patiently explained in this thread, all of this will come back to bite them on their rumps. That it will all play out leaving their house of cards hen house in crumbles. It's all on THEM and not supporters of Senator Sanders! Now, lets read what honorable Senator Warren stated about the rigged system: "a real problem" "hold this party accountable"
Washington (CNN)Sen. Elizabeth Warren said she believes that the Democratic National Committee was "rigged" in favor of former Democratic presidential nominee Hillary Clinton during the 2016 primary. "But what we've got to do as Democrats now is we've got to hold this party accountable," Warren said. don't understand the word redemption. Why someone like Donna Brazile, who was one of the corrupt foxes in their corporate establishment hen house, has come forth to free her soul. [size=150]Washington (CNN)Sen. Elizabeth Warren said she believes that the Democratic National Committee was "rigged" in favor of former Democratic presidential nominee Hillary Clinton during the 2016 primary. Remember what happened when EW endorsed HRC instead of The Messiah™? Bernieville tried to dox her Facebook. Your attempt to reform the post DWS-DNC is honorable, but please don't hold your breath. You're trying to do what's right, but in a very long running political world steeped with corruption and unethical practices, the binary parties will unlikely change. A fresh third party is the only answer for moving away from big corporate money that rules Republicans and Democrats. Concentrate more on that, sir. Whenever a Sanders supporter leans on a Free Beacon article to support their cause, it has the effect of tainting the Sanders brand because the Free Beacon is one of the most Conservative ultra far right so called news outlets there are. By comparison Fox News would be almost neutral. So strange that seemingly intelligent people have such a difficult time with this issue of source credibility. On the other end, today, we have outlets like Democracy Now being overrun with BDS nonsense, which helps to expose the depths of antisemitism on the political left in America and Britain, but with incalculable damage being done. What is it with folks that they cannot readily recognize when they are being conned by a right-woos-left scam? Yes the whackodoodke left has always had a fake news problem that matches the propagandized right in every way. It leaves them open to being recruited just as they were by literal neonazis after 9/11. It's part of how Alex Jones became so popular. Whackodoodle Lefty thought he was their friend because he too hated Bush43. I don't spend time posting about my personal likes and disliked sources by others here who struggle with the content that they disagree with. Clearly, the Senator has made statements about repairing the DNC for the better. Other sources have basically carried the Senator's same message. As honorable as it is for the Senator to believe that he might fix the DNC for the better, unfortunately, he's more than likely wasting his time calling for a better operating Veteran's Affairs. I still appreciate his efforts though. "While we set aside this particular day to recognize our veterans, I believe we must commit ourselves every day to keep America’s promise to them, just as they kept their promise to us. That means our veterans must have access to high quality health care, and we must fight to preserve, protect and improve the VA."
Clearly, the Senator has made statements. And other sources have indeed carried the Senator's message. So for crying out loud use them! When I see a Washington Free Beacon, Dally Caller, US Uncut, Gateway Pundit, Zero Hedge, Breitbart, Infowars, Daily Star UK, Daily Mail, Newsmax, the Observer, Fox, or a Washington Examiner link, and the reason it was posted wasn't to complain about how awful a source they are, I will have a cow. A whole cow. If it's on their Right Bias, Conspiracy-Pseudoscience, or Questionable Sources lists I will more than likely remark on it's questionable nature. Other sources have basically carried the Senator's same message. Then why not use those instead of garbage sources? It's not about pleasing other posters, it's about your own credibility. On the ongoing subject of 'other sources', please allow me to make clear my position. There was a time that I'd try to please Republicans and their misplaced demands. As some may or may not figure out on their own, it didn't take long for me to nix any attempt to please crybaby gangers. As clearly evident in this thread, very much the same has taken place with the usual suspect intruders of this Bernie Sanders' thread - those who I now correctly identify as Bush - Clinton Democrats. An attempt on their part to control message especially when it comes to Senator Sanders. Then, we still have our first amendment right. For those who are slightly confused, in which appears often, that applies to everyone. Yes, even usual suspects can spew whatever childish rants they wish to. It's simply not of their agenda to respect Bernie Sanders' supporters. So-be-it. I'll post whatever source that I wish to use because to be honest, nothing stops babies from crying, unless they get their way(s). I do recognize that it'll sometimes be difficult not to become like them. That's the biggest test [for me] taking place here. Among this current plethora of sexual allegations of late, there are supposedly four new sexual allegations that turned up against Mr Bill Clinton today that occurred during the early 2000s. I'll wait until these allegations are backed by more sources, but in the meantime, I won't hold my breath that our main stream media will discuss this. In the last couple of days, there has also been a couple of congresswomen to speak out against Mr Clinton and his sexual misbehavings in the past, when he held government office. So far, nothing like this has taken place with Senator Sanders. Until if and when it does, I'll continue to refer to the Senator as honorable and trustworthy. And of you don't I will cry political correctness! or identity politics! or whatever!! As clearly evident in this thread, very much the same has taken place with the usual suspect intruders of this Bernie Sanders' thread - those who I now correctly identify as Bush - Clinton Democrats. "The usual suspect intruders of this Bernie Sanders' thread." Bernie Sanders is an intruder of the Democratic Party. Oh huh! So says Trump - Sanders populists. Homeboy really thinks he owns this thread. Da Commission wants to whack the Superdelegates!? Brazile's book really got the Berniebro's off their cafe latte asses, eh. Further back, there's a WaPo link that makes some good points. Cut the rhetoric and click bait from 4SandersVet other links........And the points are the same. Not bad points. We'd do well to listen. HRC's running mate is calling for eliminating superdelegates. But wait, I thought Tim Kaine was a corporate Bush DINO? P.S. I think the superdelegate system could be reformed. It doesn't have to be eliminated. P.S.2 I thought (W.) Bush was a moron, barely literate, and until Trump came along, one of the country's worst presidents. You asked. A call for transparency and to rethink superdelegates. Hmmmm....Trying to think of an argument against it......Uhmmmm...........This may take awhile.